The promise of self-driving cars is to create a world where anyone, anywhere can summon a car and travel safely to their destination, at close to zero cost. Mobility is a space that has traditionally been operated by city governments at low cost for low convenience or by private companies at a high cost for high convenience. With the advent of on-demand mobility players like Uber and Lyft who looked to disrupt the traditionally high cost of taxi services, consumers have benefited from lower costs. However, automation through self driving technology will cause massive disruption to this industry of personal mobility with the variable cost of transportation declining to almost nothing. Companies creating autonomous taxi fleets have a unique opportunity to define and lead this shift towards virtually free and ubiquitous transportation. Personal mobility is a huge space with many incumbents vying for market share. Below is a map covering some of the major players currently operating in the space. The landscape includes both autonomous/regular taxi services, as well as on-demand/public transport services. Firms that charge relatively low prices and offer substantial differentiation are following a best-cost strategy. This strategy is difficult to execute, but it is also potentially very rewarding. Self-driving taxi companies are creating one of the most compelling executions of this strategy, by offering the lowest cost transportation at the highest convenience. However some of the major challenges they will need to address are around technology, regulation, business models, and distribution. The tech to enable fully driverless cars is already here, and the next few years will see huge advances in these systems. Additionally, owing to the fact that self-driving cars have the potential to save millions of lives it is high on the agenda of lawmakers to quickly finalize regulation to allow these vehicles on the roads. 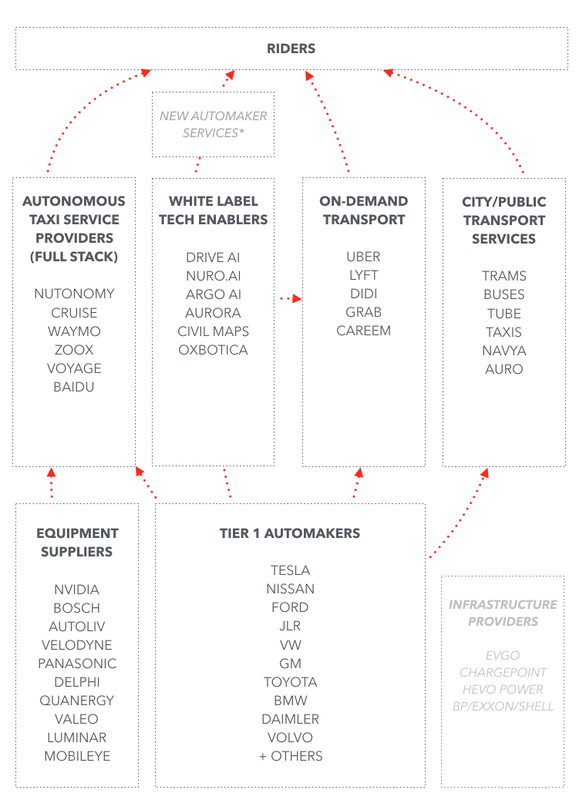 Autonomous taxi firms will innovate with new business models such as advertising, sponsorships, in-car services, and more to allow them to drive costs of transport to almost zero, offsetting the variable costs with these additional revenue streams. Finally of all these challenges, only distribution remains the biggest hurdle to existing incumbents and new entrants in the space to be able to create a competitive advantage to win. 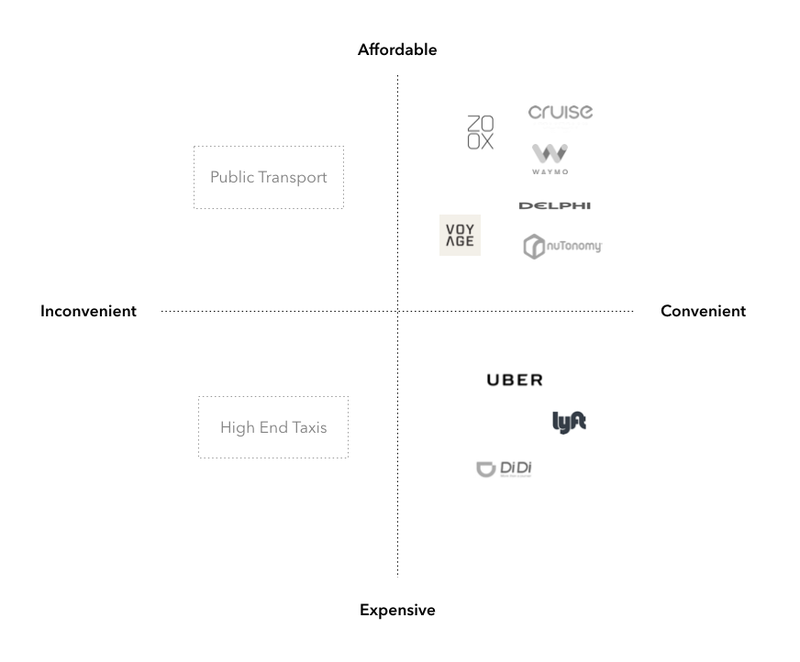 As the autonomous taxi space continues to get crowded even at this early stage before any full rollouts, companies will need to understand the competitive landscape with operators across the entire value chain. It is expected that soon consumers will no longer buy cars and instead treat transportation and personal mobility as a public utility just like electricity, water and the internet. This dynamic will significantly change how suppliers and vendors in the space consider their existing business models. Major automakers are keen to avoid the same fate of telecoms being relegated to ‘dumb pipes’ due to the advent of mobile internet and over the top communications, and are now committed to deploying their own self-driving taxi fleets as they adapt their strategies to move away from being manufacturers to becoming service providers. As a result players in this space will need to create significant competitive barriers and moats around their business models to fend off not only incumbents but also new entrants. The way that an autonomous taxi firm can create sustainable competitive barriers and win in this space is by deploying the largest fleet of self-driving taxis as soon as possible and by creating cyclical economies of scale on both the supply side and demand side (network effects). Players in the space should create supply side economies of scale by partnering with tier 1 automotive manufacturers to drive down costs of vehicle manufacturing, and by exploring additional revenue streams to offset the cost of transport. 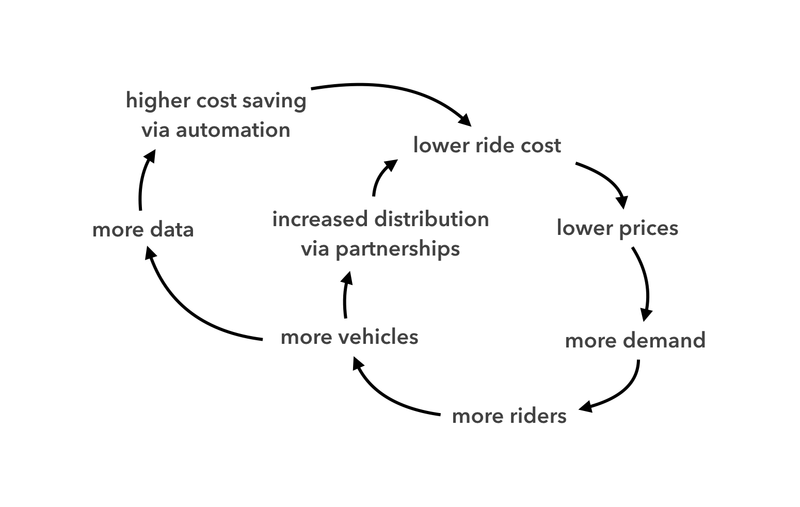 To create cyclical network effects through increased distribution, players should partner with city/government bodies to become the fleet operator of choice. This would be a powerful way to create lock-in and distribution and a way to become the default option for riders in cities across the world. Ali Ahmed is an entrepreneur with expertise in on-demand mobility and robotics.